Once you have decided on who you are targeting, what to say and what the flyer will look like then the design is ready to be converted from concept to reality. There are a huge number of printers of all shapes and sizes around and the current economic climate has meant many more bargains that previously .. although, unfortunately many more print companies failing as well. Please be careful of using internet sites that do not have phone numbers or UK addresses as this industry is truly global. Many 'cheap' printers are actually brokers without any office presence and they rely on shopping around to get the cheapest quote to make the best price .... this can save you the time and effort but if it means it is being printed in Eastern Europe, Turkey or even China, do be aware that shipping or customs delays can be damaging if your material is dated or is for a specific event. You are very welcome to use any printer you wish and if easier, you can arrange for them to ship directly to us rather than have to wait in for the parcel or trek over to a Courier Depot. Easier still, we would be happy to handle the printing for you as well. We run our own 'fleet' of copyprinters for simple single colour leaflets and have close relationships with several UK High Quality full colour printers who, on account of the business we pass them, can offer great rates with no fuss at all. 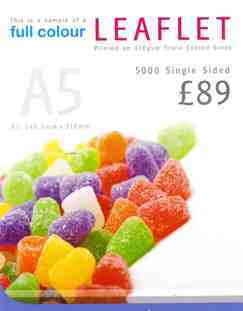 Currently we are offering simple A5 flyers, single colour print on tinted paper for £9.50 for 1,000 - printed in 1 hour and free simple design and if you are looking for a more sophisticated "full colour" print, if you supply the artwork - we are offering print of 5,000 full colour double sided A5 flyers for just £89 & 10,000 for just £159 inclusive. All those little extras added on by many printers such as Disk or Artwork checking, carraige or delivery charges are all included in the price. The only possible addition is VAT but this is very rarely applicable to leaflets. VAT is not generally charged on leaflets. The regulations are relatively complex but essentially if they are not specifically designed to be permanently retained, pharm stuff completed or returned whole or principally used for a purpose other than providing 'short term' information, click then they are Zero Rated. Of course, shop if you are VAT registered you can reclaim it back anyway. If the material is also a ticket, calendar or printed on thick card and/or laminated ... this would then suggest that it was to be retained & would have VAT applied to the cost. More details can be obtained here. Leaflets are not defined in law so whether a particular product qualifies as a leaflet is a matter of fact and impression. will either be of an ephemeral nature (designed to be read a few times and then thrown away) or be designed to accompany some other product or service, for example an instruction leaflet. We consider that items printed on laminated paper are designed to be kept and therefore not leaflets. On the other hand, orders of service are not normally designed to be kept and may be zero-rated. parts to be detached and returned. Where there is both an area for completion and a part to be detached and returned, then the two together must not exceed 25% of the total area of the publication. If you have items with areas for completion or detachment which does exceed 25%, but you consider they are nevertheless not primarily forms or other stationery, you should obtain a written ruling from our National Advice Service before zero-rating them. Whatever the area for completion, a publication which is designed to be returned whole after completion is always standard-rated. Brochures and pamphlets are not defined in law and whether a particular product qualifies as a brochure or pamphlet is a matter of fact and impression. Items with areas for completion Items which might otherwise be considered to be brochures and pamphlets may not be zero-rated if they are primarily intended for completion or detachment.